NORDIKA is a shopping center in Vilnius, capital city of the Republic of Lithuania. The center occupies the area of 38 000 square meters, and the steel construction weights 1 200 tons. The center will host over 40 different shops and restaurants. Shopping center NORDIKA was one of the first BIM projects of this complexity in Lithuania. Documentation, time management, and price calculations were all successfully merged into a single five-dimensional model of the building. All steel and concrete structures were modelled, constructed, and installed without a single mistake. This was despite the very tight schedules for planning and construction. BIM and Tekla Structures were efficient tools in making this all possible. BIMsight provided a simple and effective real-time coordination system since communication had to be sound and clear. 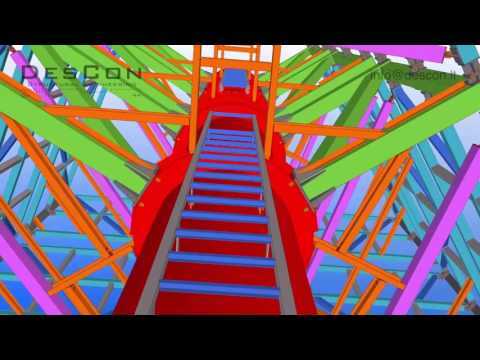 Tekla BIMsight communication was used to ensure the smooth coordination between the parties involved. In fact, the architects and engineers never had a face-to-face meeting. Instead, the collaboration was done via Tekla BIMsight. All IFC-files were shared in a cloud and notes in Tekla BIMsight were in heavy use. All project parties were very satisfied with the method. Thanks to 3D visualizations, also non-specialist customers were able to monitor the design during the entire process, which enabled them to participate and express their views.